dal bukhara is a rich, creamy slow cooked whole urad dal (black gram) with tomato puree, butter and cream. dal bukhara recipe is made famous by ITC maurya hotel in delhi. 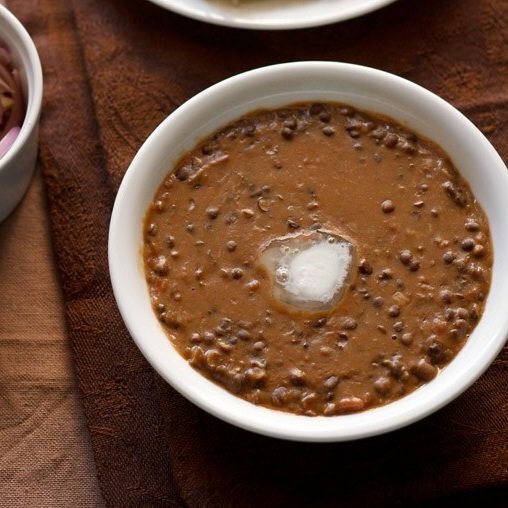 dal bukhara recipe with step by step photos – a dish that comes close to dal makhani and was made famous by the ITC maurya hotel in new delhi. the recipe of dal bukhara consists of minimal ingredients and this is what brings out the best in this recipe. 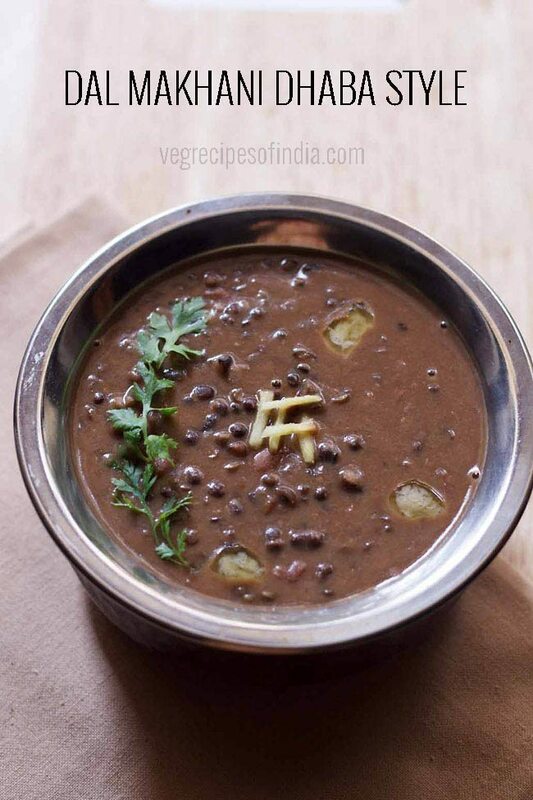 unlike dal makhani, dal bukhara is made only with whole urad lentils (black gram) and not with rajma (kidney beans). also dal bukhara is slow cooked overnight on the tandoor. 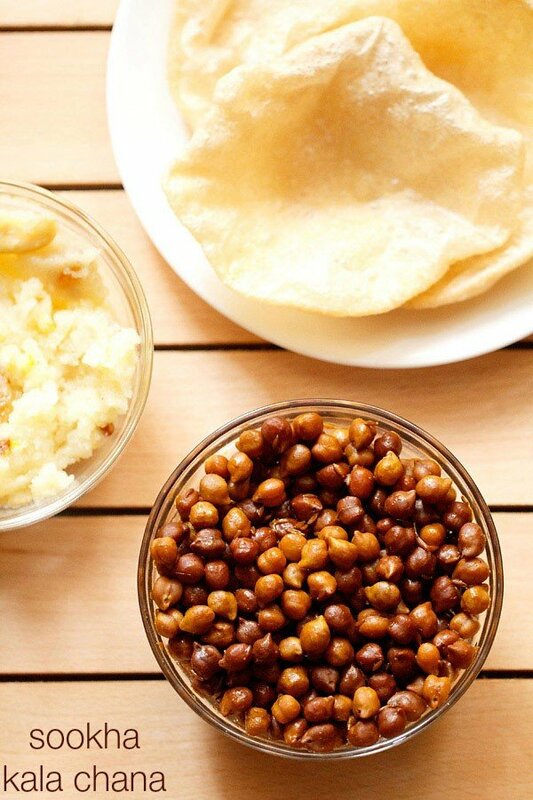 i first came across this simple creamy lentil dish in femina magazine many years ago. the recipe section in this issue had recipes from maurya sheraton and surprisingly the itc maurya sheraton chefs had shared the recipe of dal bukhara along with the other recipes. when i read the dal bukhara recipe first time, i was surprised that the recipe bore close resemblance to butter chicken or paneer makhani. dal makhani was not in my repertoire then. now i can say that the sauce made for dal bukhara and dal makhani is similar to butter chicken. what i felt and thought many years back is confirmed by this excellent informative piece of indian cuisine history here by vir sanghvi. i had kept the dal makhani recipe cut outs in a book safe and secure. we shifted our home a few times and along with usual changes that happen throughout life…. dal bukhara was forgotten for many years. so when i started food blogging, i went to check the recipe and i was in for a surprise. out of the 3-4 pages i had kept, only 2 pages were left. some how the other pages had got misplaced. and one of the missing pages had the original authentic recipe of dal bukhara from the itc maurya sheraton chefs. i only had the page having the dal bukhara photo 🙁 (pictured below). so i recollected the ingredients used in the original recipe. i even got the dal bukhara ready to eat pack just to check the ingredients used. the only spice which i was not sure of was tej patta. so i knew almost all the ingredients but i did not know their proportions. i experimented and made dal bukhara twice and felt something missing. third time it came close to the original one. the only ingredient missing was the charcoal flavor. also i have not slow cooked the beans overnight on a tandoor. i don’t have wooden or charcoal embers nor do i have a tandoor or time to cook dal bukhara overnight. a slow cooker would do the job. but i have no experience with a slow cooker. so i have pressure cooked the beans first and then slowly simmered the dal with tomato, cream, butter and ginger-garlic for 1 hour 25 mins on a low flame. you can give a charcoal flavor to dal bukhara which we call as dhungar. details on how to do the dhungar or smoking technique, i have mentioned in the recipe details notes section. 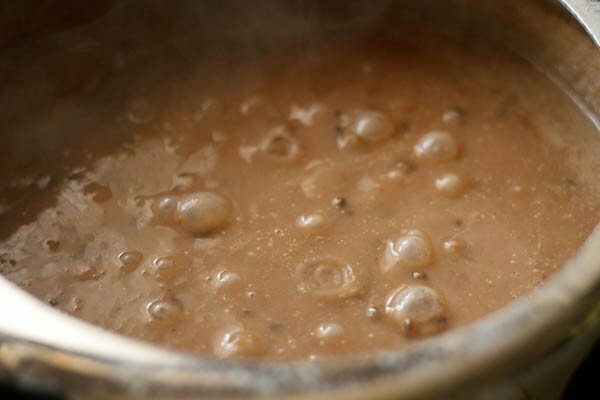 i have explained the dhungar technique in more detail in this dal tadka recipe. 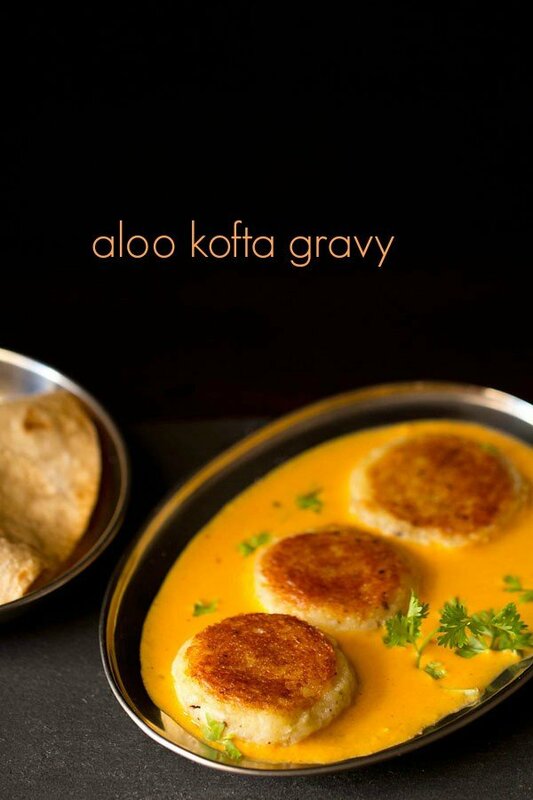 the dal bukhara is a rich recipe with the amount of butter and cream gone in its preparation. to get the real taste i would not suggest reducing the cream or butter. as i have tried with less amounts of butter and cream and it just had that ‘something is missing or just not right’ point. i have used unsalted white butter and amul cream (25% low fat). you can use any good brand of butter and low fat dairy cream (25% to 30%). serve dal bukhara hot with jeera rice or naan or lachha paratha or phulka or tandoori rotis or khasta rotis. it goes best with naan. 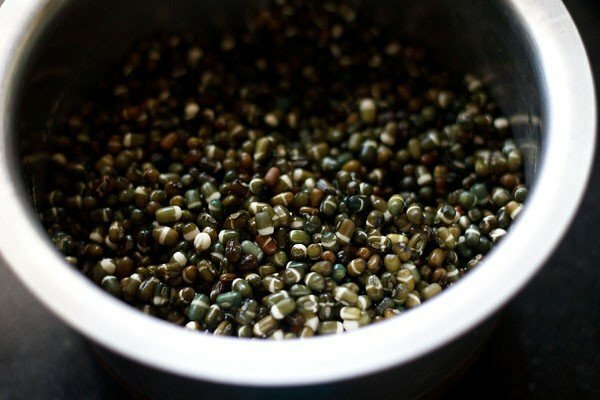 soak the lentils in enough water overnight or for 7 to 8 hours. drain them later and add the drained lentils in a 3 or 4 litre pressure cooker. add 4.5 to 5 cups water and pressure cook the lentils for 16 to 18 whistles or about 18 to 20 minutes. 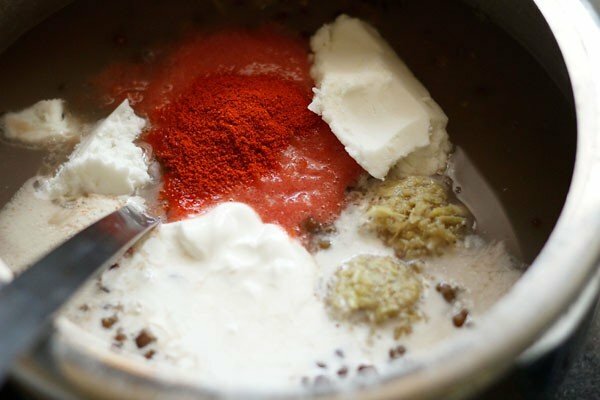 meanwhile when the lentils are getting cooked, make a puree of the tomatoes in a blender and crush the ginger and garlic to a paste in mortar-pestle. when the pressure settles down on its own, open the lid of the pressure cooker. then add the ginger garlic paste, tomato puree, kashmiri red chili powder, butter, cream and salt. also add 1 to 1.5 cups of water. stir very well and keep the pressure cooker without its lid on a low flame. let the dal simmer for about 1 hour or for 1 hour 30 mins. meanwhile keep on stirring often, so that the lentils don't stick at the bottom of the cooker. also mash some of the lentils while stirring. 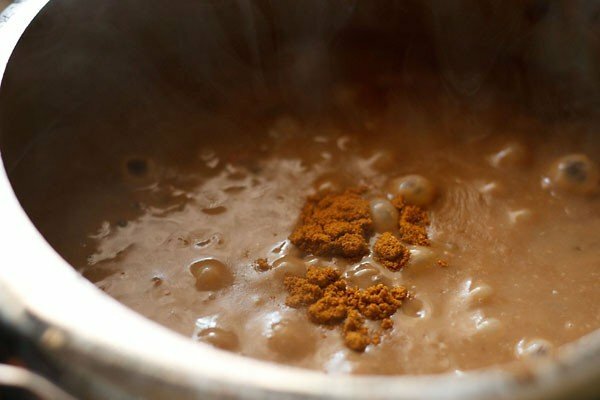 if the dal bukhara becomes thick, then add some hot water. once done, check the taste and add more red chili powder or salt if required. lastly sprinkle garam masala powder and stir well. while serving dal bukhara, dot with the butter or cream. garnish with ginger juliennes. serve dal bukhara hot with jeera rice, naan, paratha or rotis. secure firmly a small piece of the coal between a tong. heat it in the flame till it becomes red hot. now place the red hot coal in a small steel bowl. place this bowl on top of the cooked dal bukhara in the cooker. pour a few tsp of ghee (oil or butter) on the coal and quickly cover the lid of the cooker tightly. keep for a few minutes and then open the lid. if you want a pronounced charcoal flavor in the dal bukhara, then you have to keep for a few minutes more. 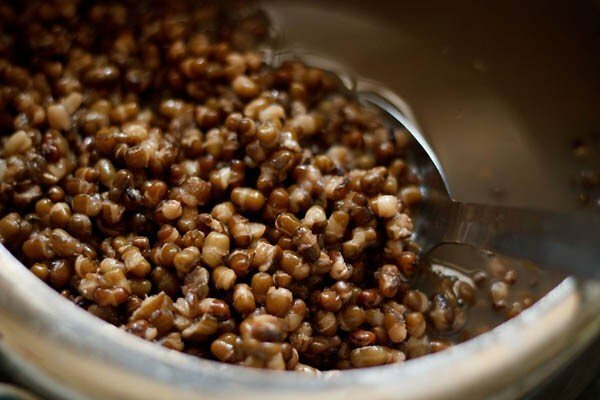 1. soak 1.5 cups whole urad dal (whole black gram) in enough water overnight or for 7 to 8 hours. drain them later and add the drained lentils in a 3 or 4 litre pressure cooker. add 4.5 to 5 cups water and pressure cook the lentils for 16 to 18 whistles or for about 18 to 20 minutes. pic below of the soaked and drained lentils. 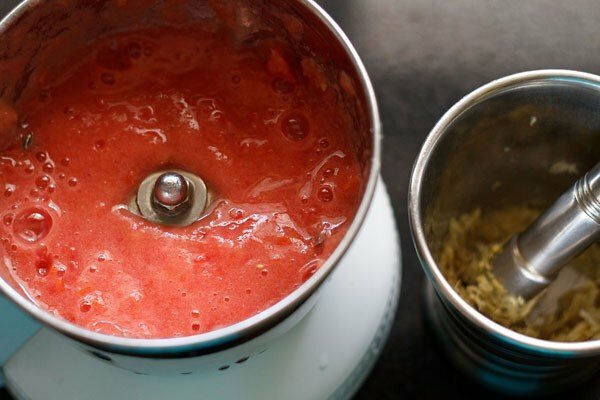 2. meanwhile when the lentils are getting cooked, make a puree of the 250 gms tomatoes (3 medium to large tomatoes) in a blender. crush the ginger and garlic to a paste in a mortar-pestle (½ inch ginger + 4 to 5 medium garlic or about 2 tsp of ginger garlic paste). 3. when the pressure settles down on its own, open the lid of the pressure cooker. the lentils should be cooked well and soft. 4. now add the ginger garlic paste, tomato puree, 1 tsp kashmiri red chili powder, 6-7 tbsp white butter, 7-8 tbsp low fat cream, 1 to 1.5 cup water and salt. 5. stir very well and keep the pressure cooker without its lid on a low flame. 6. let the dal simmer for about 1 hour or more. meanwhile keep on stirring often, so that the lentils don’t stick at the bottom of the cooker. the lentils become viscous and start to stick at the bottom if not stirred. 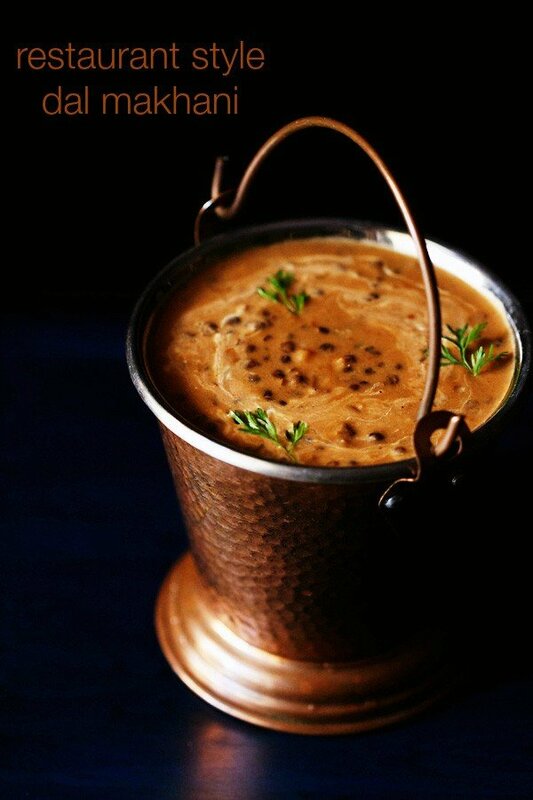 the lentils would become creamy and the consistency of the dal bukhara will keep on thickening. you can add some hot water to reduce the dal bukhara from getting too thick. also mash some of the lentils while stirring. 7. towards the end, check the taste and add more red chili powder or salt if required. lastly sprinkle ½ tsp garam masala powder and stir well. 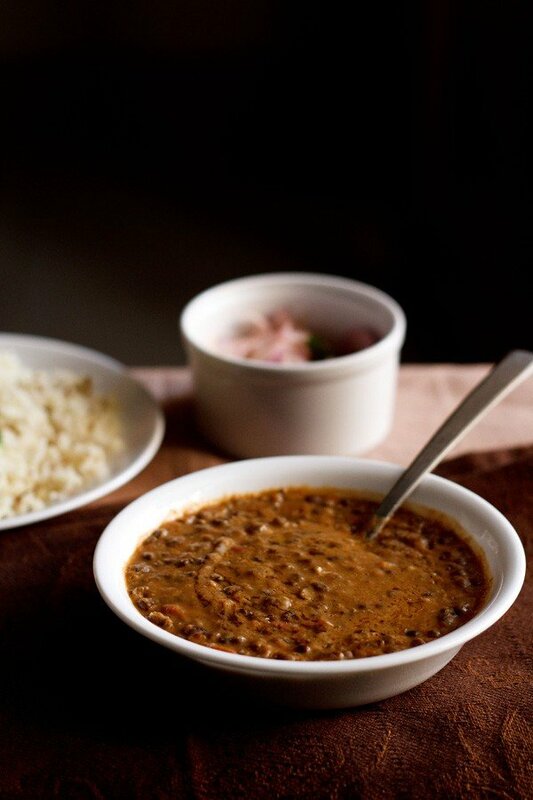 the consistency of dal bukhara is like dal makhani. 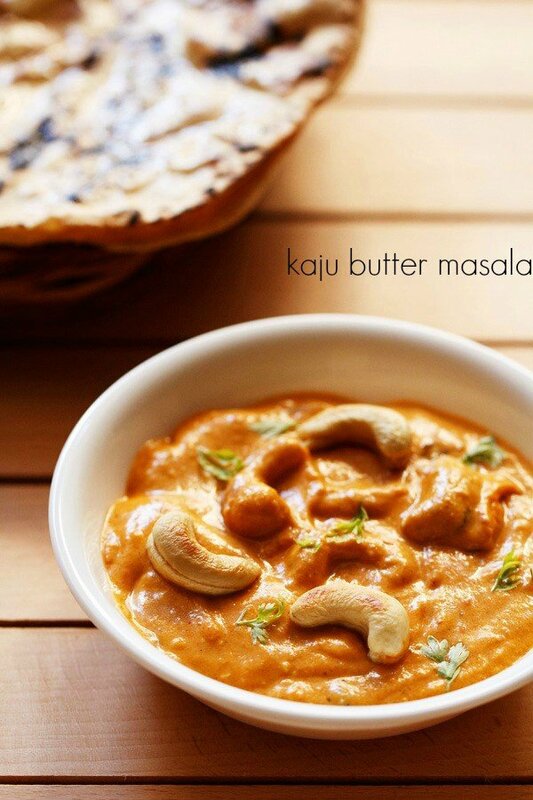 8. while serving dal bukhara, dot with 1 tbsp butter or cream. garnish with ginger juliennes and serve dal bukhara hot with jeera rice, naan, paratha or rotis. it goes best with naan. i served dal bukhara with jeera rice and onion ring salad. 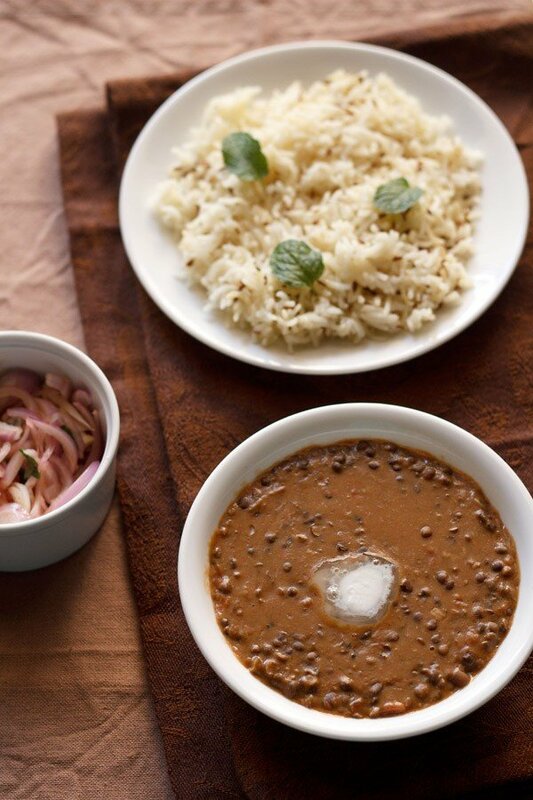 I have not tried this recipe yet but your dal Makhani recipe is my favourite. I have made it many times and always get many compliments so I am looking forward to trying this slightly different dish. Thank you for the down to earth detailed instructions that you give. thank you debi. 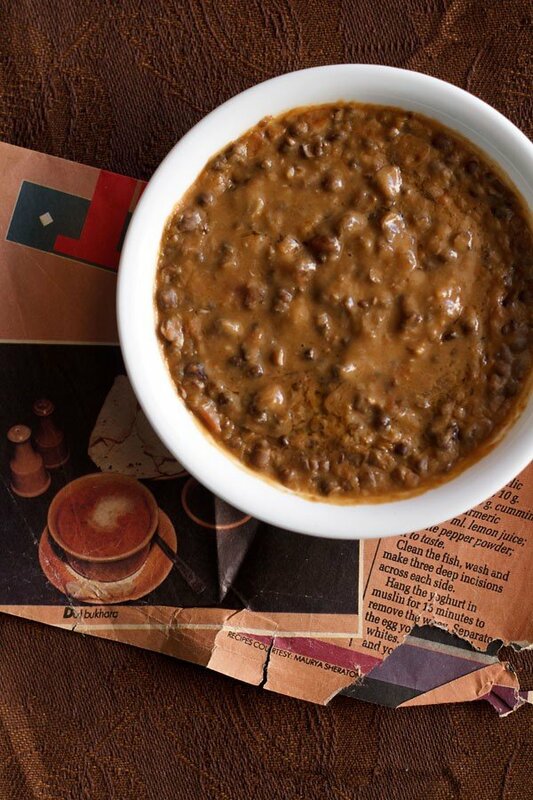 glad to read your feedback on dal makhani. dal bukhara also tastes very good and i am sure you will like it. happy cooking. hi..thanks for this great recipe . This recipe Dal Bukhara is tge creation of the great padma shri Masterchef Imtiyaz Qureshi of India.. love this recipe. welcome and thanks for sharing this information. good to know. indeed the recipe is a lovely creation. Welcome Jayanti. Glad to know that everyone liked the recipes. Hope you all had a great time. Thanks for your positive feedback. Dassana ji you are simply amazing.. I tried many of your recipes. Today i made Dal Bhukhara. It is really very delicious. Without you it cannot be happen.Thanks so much for sharing lots of recipes for us. Welcome ISHA. Thanks for your kind words and positive feedback on recipes. I am a big fan of your recipes. Your dal bukhara version is my version of Dal makhni. I read it many years ago in a Sanjeev Kapoor cook book and since then I am making it this way only. 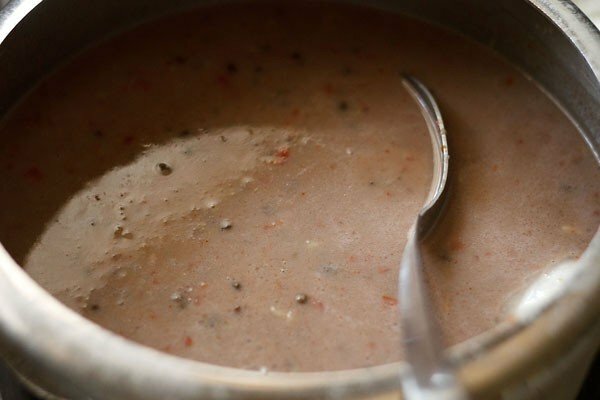 The only difference is as its dal makhni I add finely chopped onion, garlic and ginger while cooking the dal and once its done I add 1cup whole milk and after few minutes pureed tomatoes. It always comes out amazing. Its a hit in my circle. I’ll surely try this recipe too. thanks nisha for the feedback and also for sharing your dal makhani recipe. i will give a try as i never add milk. i am sure it will be good. do try this dal bukhara recipe also. its a favorite at my place and you will like it. Today I will be making dal.bukhara. is it necessary to put fresh cream. What is the use .what if I want to skip it.??? Swati, don’t skip cream otherwise there will be some flavor loss. Its a rich creamy dal. Can I use whipping cream instead of fresh cream? Or any other substitute you can advise. We don’t get Malai/Fresh cream in US. you can use whipping cream. 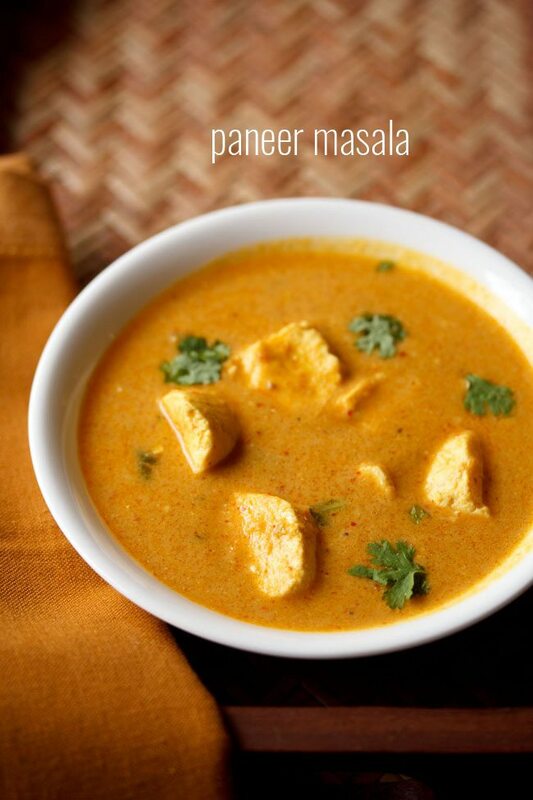 for any curry or gravy recipe that requires cream, you can also use whipping cream. but add less as whipping cream has a higher fat content. in this dal bukhara recipe you can add about 3 to 4 tablespoons of whipping cream. How do i get the recipe for dal bukhara? jenny, you are on the right link. probably you need to scroll down to see the recipe card. No kasturi methi in dal bukhara? there is no need to add kasuri methi in dal bukhara. slow cooking gives so much of flavor to the dal that more spices or herbs are not required. but if you want you can add kasuri methi also. I 1st heard this recipe on TLC’s show of Gordon Ramsay that time I know about Dal Bukhara your recipe looks same thanks alot for recipe.My also kept recipe’s pages and magazine and those are date back of 1990s whenever i got time I search them for recipe. I learn many recipe from those too. thanks harqulis. nice to know that you also have a collection of recipes from magazines and pages. i agree one learns from these recipes too. thanks divya. you can use kidney beans. We have to cook d dal on high flame or medium flame? you have to cook dal on low heat neha it’s dal bukhara which is cooked slowly on low heat. hope this help’s you. All receipes are easy to try at home.Thanks Mr.Amitji Dasana.